For the most part, hospice care is delivered and administrated by those wonderful folks we call hospice workers. They include the nurses, nursing assistants, social workers, doctors, administrators and chaplains. They are trained professionals, and their charge is the complete care of the departing. Were it not for these kind and good souls hospice care would not exist. Hospice volunteers are not hospice workers. Workers get paid, albeit at times, the compensation may be meager. Workers do however, receive income with which they sustain themselves. They are called, but they are also paid. The volunteer, on the other hand, receives no monetary compensation. It is this crucial distinction that adds an element of joy and spirituality to his task that others can never know. The hospice volunteer is a servant, a steward of the final days of life. The volunteer gets no remuneration or compensation of any kind, thereby making his or her work a pure act of love; and it is only from acts of pure love that miracles can spring. The hospice volunteer is called to give. He must give of his time, he must give of his money, he must give of his heart. And that giving springs only from the love within. The volunteer cannot give from a sense of guilt, or obligation, or desire for recognition. Were he to base his actions on those things, the work would become like chewing on shards of glass or listening to fingernails on a chalkboard interminably. The doing of such work is so counter intuitive to any of those motivations that at the onset, one would get the perception of mixing oil and water: a dichotomy which is never able to find solution. The volunteer, by his sacrifice without remuneration, is able spiritually to reach into a place with the patient that the worker cannot reach. Like the patient, the volunteer has no need to look at his watch, to worry about the “next case” nor any need to view his actions in light of how a superior will judge them. Like the patient, the volunteer has no time more important than the present moment, and no witness needing to be impressed. Like the dying, the volunteer is a free agent, able to determine his own path. His kinship with the patient extends further. The patient has hitherto spent a lifetime trying the accumulate the things necessary to live a good life. He has tried to prove his points on no end of arguments, he has passionately tried to defend himself and others, and he has agreed and disagreed with reasons and positions one after the other, the likes of which could fill volumes; at least up until these days. Today, however, there is nothing left to accumulate, nothing left to prove, nothing left to argue. Today, there is only today, and the volunteer knows that, and for him, there is only today as well, for he knows, from scores of patients past, that there are many, many todays that do not have a tomorrow attached to them. So friends, the volunteer knows the patient, and he knows what the patient needs. The volunteer knows he can give love with no strings attached. The volunteer knows he can let his charge slip away without the desire to call him back. The volunteer knows he can soothe the pains with no expectation of recognition or of recompense. The volunteer knows he can release the soul to the angels, and smile as they arrive; being well aware of what lies on the other side. Join us!! Become a hospice volunteer with Arkansas Hospice! Click here for more information. You cannot find yourself when your existence is untroubled, when the sky is sunny and calm and all seems smooth and placid. It is only when the storm rages, the thunder roars, the lightning flashes and the rain beats down that this wondrous spiritual awakening comes. The path has not been easy, but this is good for you. Do not complain about difficulty; it is the spur of the spirit. Meet the challenge always with the knowledge that you have. The power of the spirit is great than the power of matter. When confronted with problems, pause, let the spirit show the way and be determined that nothing will deflect you from the service that you were born to give. You have helped many, you will continue to help many; You are on a path of service, accomplishing far more than is being done by dignitaries of the churches, however sincere they may be. You are bringing the truths of the spirit to those unaware of them. You are helping them to fulfill the purpose of their being. You are helping them to find their spiritual feet. You are spreading knowledge. All this is divine labor. You should be proud that you are called into this service. Life is full of problems. There are very few roses and mostly thorns. But the power that guides you is the power that created the universe, the power that is infinite. Pay no attention to the folly of those who should know better. Ignore the pinpricks and the jealousies. These are unimportant. Try to feel sorry for those who do not measure up to what is expected of them. Anyway, that is their responsibility. If you happen to believe that the grave is the goal, spend 15 minutes with this video. This young filmmaker will be at our upcoming conference in June. www.afterlifeconference.com Please consider attending the Conference if you are involved in the dying trades. Great resources. Once again, out keynote speakers will be Eben Alexander and Raymond Moody. 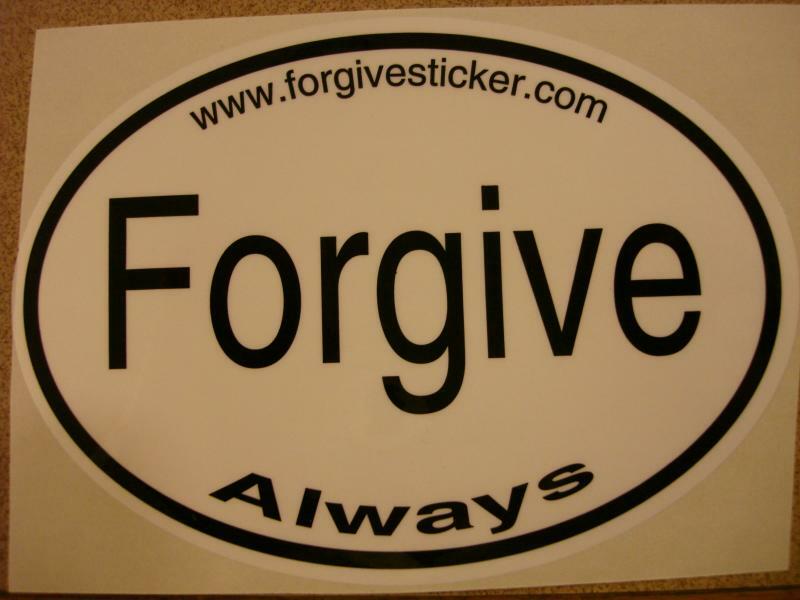 One thing we can't give or receive enough of is forgiveness. Heaven knows, if there is one thing that seems to be present with the dying and their families it is forgiveness. Why wait? Why not go ahead and start the process of letting go. Get a sticker or two for you and some for your friends. A whopping 50 cents each, give us a call and get fixed right up. 501-753-4552 during office hours!